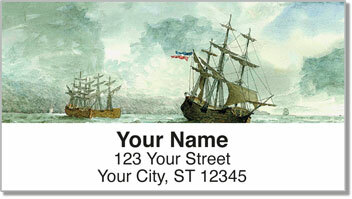 The attractive nautical images featured on these return address labels were inspired by the age-old art of scrimshaw. Hundreds of years ago, sailors on whaling ships would etch designs into the bones and tusks of whales and walruses. The artistic carving method continues to this day, and is collected by lovers of maritime memorabilia. 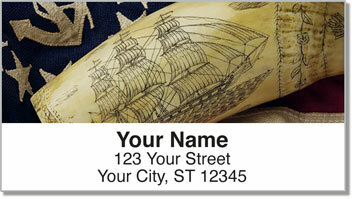 Scrimshaw Ships Address Labels are a CheckAdvantage exclusive. You won't find these labels anywhere else online. Use them to give your outgoing mail a classy look while eliminating the time it takes to write out your return address by hand! 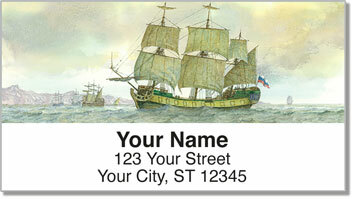 Order your very own Scrimshaw Ships Address Labels today! 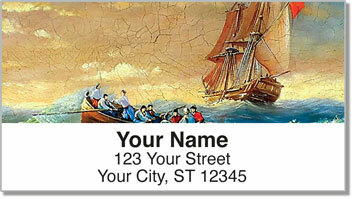 You can also get this eye-catching design in a set of matching personal checks!